In the tradition of his Flemish predecessors, Memling's painting contains a wealth of religious meaning; it is filled with symbols which explain the importance of Christ's mission on earth. Jesus reaches out for an apple, emblem of Original Sin; his attitude of acceptance foreshadows his future sacrifice on the cross. The angel who offers the fruit of redemption is in fact dressed in a dalmatic, the liturgical vestment worn by a deacon during the solemn High Mass. Around the arch is a carved vine of grapes referring to the wine of the eucharistic rite. On the crystal and porphyry columns stand David, as an ancestor of Christ, and Isaiah, one of the prophets who foretold the Virgin Birth. 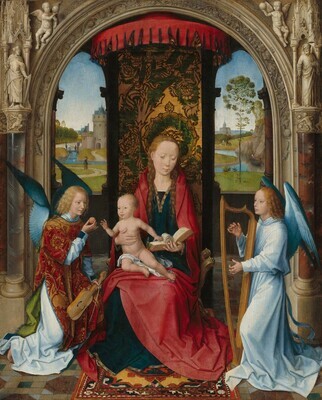 Memling adhered closely to the northern tradition in art; the format and details of the enthroned Madonna theme recall Jan van Eyck. It is believed that Memling worked in the studio of Rogier van der Weyden at Brussels before settling in Bruges; here, he adopted Rogier's angular figural types clothed in heavy, crisp drapery, but transformed the older artist's dramatic intensity into a calm and graceful elegance. The framing archway was a device used by a number of Flemish painters including Rogier. While combining various influences, Hans Memling's own tender and pious sentiment made him the most popular artist of his day in Bruges. Probably Leopold III Friedrich Franz, Duke of Anhalt-Dessau [1740-1817], Gotisches Haus, Wörlitz, near Dessau; probably by inheritance to his grandson, Leopold IV Friedrich, Duke of Anhalt [1794-1871], Gotisches Haus; by inheritance to his son, Friedrich I, Duke of Anhalt [1831-1904], Gotisches Haus; by inheritance to his son, Friedrich II, Duke of Anhalt [1856-1918], Gotisches Haus; by inheritance to his son, Eduard Georg Wilhelm, Duke of Anhalt [1861-1918], Gotisches Haus; by inheritance to his son, Joachim Ernst, Duke of Anhalt [1901-1947], Gotisches Haus; sold early 1927 to (Hugo Perls, Berlin); sold via the Mannheimer collection, Amsterdam, to (Duveen Brothers, Inc., London, New York, and Paris); purchased November 1927 by Andrew W. Mellon, Pittsburgh and Washington, D.C.; deeded 5 June 1931 to The A.W. Mellon Educational and Charitable Trust, Pittsburgh; gift 1937 to NGA. This prince built the Gotisches Haus and its English park and was an active collector, adding early German and Netherlandish paintings to the family holdings; see C. Rost, "Der alte Nassau-Oranische Bilderschatz und sein späterer Verbleib," Jahrbücher für Kunstwissenschaft 6 (1873), 52-93, esp. 78-79, listing early catalogues of the collection. The descriptions in the early catalogues of the Anhalt-Dessau collection are not sufficiently specific to identify the Madonna and Child with Angels. According to a note on a photograph in the Friedländer archive, Rijksbureau voor Kunsthistorische Documentatie, The Hague; and a letter of 23 October 1961 from Hugo Perls to the NGA (in NGA curatorial files). Duveen Brothers Records, accession number 960015, Research Library, Getty Research Institute, Los Angeles: reel 120, box 265, folder 18; and transcriptions from the Duveen Brothers Records (copies and transcriptions in NGA curatorial files). Exposition des primitifs flamands et d'art ancien, Hôtel de Gouvernement Provincial, Bruges, 1902, no. 79. Loan Exhibition of Flemish Primitives, F. Kleinberger Galleries, Inc., New York, 1929, no. 22. Memling. Rinascimento fiammingo, Scuderie del Quirinale, Rome, 2014-2015, no. 28, repro. The panel is composed of two boards aligned vertically with a join 34.2 cm from the left edge. It is mounted on a thin secondary panel of the same wood as the cradle. There are numerous very small losses, especially at the top left and top right corners and the bottom of the right angel's robe. Losses along the splits and the join have been filled and inpainted. The Madonna's features and some of the outlines of her robe have been strengthened. In general the numerous tiny strokes of inpainting make the picture appear to be in more pristine condition than is actually the case. The figural group and the landscape are underdrawn in what seems to be black chalk. The figural group and the landscape are underdrawn in what seems to be black chalk. Crowe, J. A., and G.B. Cavalcaselle. The Early Flemish Painters: Notices of Their Lives and Works. 2nd ed. London, 1872: 273, 280. Kaemmerer, Ludwig. Memling. Bielefeld and Leipzig, 1899: 134, fig. 116. Weale, W. H. James. Hans Memling. London, 1901: 76, 104. Hulin de Loo, Georges. Bruges. Exposition de tableaux flamands des XIVe, XVe, XVIe siècles. Catalogue critique. Ghent, 1902: 18, no. 79. Hymans, Henri. "L'Exposition des primitifs flamands à Bruges." Gazette des Beaux-Arts 28 (1902): 288 (repr. as a book, Paris, 1902: 56). Friedländer, Max J. "Die Brügger Leihausstellung von 1902." Repertorium für Kunstwissenschaft 26 (1903): 83. Weale, W. H. James. "The Early Painters of the Netherlands as Illustrated by the Bruges Exhibition of 1902." The Burlington Magazine 2 (1903): 35. Benoit, François. "Un Gérard David inconnu." Gazette des Beaux-Arts 32 (1904): 321. Wurzbach, Alfred von. Niederlandisches Kunstler-Lexikon. 3 vols. Vienna, 1906-1911: 2(1910):138, 143, 144. Vollmer, Hans. "Memling." In Thieme-Becker. 37 vols. Leipzig, 1907-1950: 26(1926):375-376..
Voll, Karl. Memling (Klassiker der Kunst). Stuttgart and Leipzig, 1909: 136, repro. 178. Durand-Gréville, E. "Notes sur les primitifs néerlandais du Louvre." Gazette des Beaux-Arts 10 (1913): 426. Vioux, Marcelle. Memling. Paris, 1924: 69. Hulin de Loo, Georges. "Hans Memlinc in Rogier van der Weyden's Studio." The Burlington Magazine 52 (1928): 171.
International Studio 97 (December 1930): repro. 28. Huisman, Georges. Memlinc. Paris, 1934: 146. Tietze, Hans. Meisterwerke europäischer Malerei in Amerika. Vienna, 1935: 135, repro. (English ed., Masterpieces of European Painting in America. New York, 1939: 135, repro.). Cortissoz, Royal. An Introduction to the Mellon Collection. Boston, 1937: 34. Jewell, Edward Alden. "Mellon's Gift." Magazine of Art 30, no. 2 (February 1937): 72, repro. De Tolnay, Charles. "Flemish Paintings in the National Gallery of Art." Magazine of Art 34 (April 1941): 181-182, 200, fig. 10. Duveen Brothers. Duveen Pictures in Public Collections of America. New York, 1941: no. 178, repro. Preliminary Catalogue of Paintings and Sculpture. National Gallery of Art, Washington, 1941: 132, no. 41. Baldass, Ludwig von. Hans Memling. Vienna, 1942: 22, 43, no. 70, fig. 70. Book of Illustrations. National Gallery of Art, Washington, 1942: 240, repro. 39. Comstock, Helen. "A Memling for the Nelson Gallery of Art." The Connoisseur 116 (1945): 37. Paintings and Sculpture from the Mellon Collection. National Gallery of Art, Washington, 1949 (reprinted 1953 and 1958): 57, repro. Cairns, Huntington, and John Walker, eds., Great Paintings from the National Gallery of Art. New York, 1952: 86, color repro. Panofsky Erwin. Early Netherlandish Painting: Its Origins and Character. 2 vols. Cambridge, Mass., 1953: 1:349-350, 507, 2:pl. 320, fig. 481. Verhaegen, Nicole. "Notes à propos de Jean Gossart et d'une `Tentation de S. Antoine'." Musées Royaux des Beaux-Arts de Belgique 4 (1955): 181. Walker, John. National Gallery of Art, Washington. New York, 1956: 9, repro. Broadley Hugh T. Flemish Painting in the National Gallery of Art (Booklet no. 5 in Ten Schools of Painting in the National Gallery of Art, Washington, DC). Washington, 1960: 24-25, color repro. Wilkenski, R. H. Flemish Painters, 1430-1830. New York, 1960: 686. Birkmeyer, Karl M. "The Arch Motif in Netherlandish Painting of the Fifteenth Century: A Study in Changing Religious Imagery." Art Bulletin 43, no. 2 (June 1961): 110-111, fig. 29. Mirimonde, Albert P. de. "Les anges musiciens chez Memling." Jaarboek van het Koninklijk Museum voor Schone Kunsten Antwerpen (1962/1963): 14, 53. McNamee, M. B. "Further Symbolism in the Portinari Altarpiece." Art Bulletin 45 no. 2 (June 1963): 143, fig. 2. Schoute, Roger Van. Primitifs flamands. Corpus: Grenada. Brussels, 1963: 77. Denis, Valentin. "Memling." In Encyclopedia of World Art. 16 vols. New York, London, and Toronto, 1959-1983. Vol. 9 (1964): column 733. Cairns, Huntington, and John Walker, eds. A Pageant of Painting from the National Gallery of Art. 2 vols. New York, 1966: 1:86-87, color repro. European Paintings and Sculpture: Illustrations (Companion to the Summary Catalogue, 1965). Washington, 1968: 78, no. 41, repro. Galvan, Jose Maria Moreno, ed. Galleria Nazionale di Washington. Madrid, 1968: 21, color fig. 1. Corti, Maria, and Giorgio T. Faggin. L'opera completa di Memling. Milan, 1969: 107, no. 78, repro. Pauwels, H. In Antonieme Vlaamse Primitieven. Exh. cat. Groeningemuseum, Bruges, 1969: 45-46. Rensch, Roslyn. The Harp: Its History, Technique and Repertoire. London, 1969: 55, pl. 18a. Ward, John L. "A Proposed Reconstruction of an Altarpiece by Rogier van der Weyden." Art Bulletin 53, no. 1 (March 1971): 29. Campbell, Lorne. Review of Hans Memling by K. B. McFarlane. In Apollo 96 (1972): 564. European Paintings: An Illustrated Summary Catalogue. National Gallery of Art, Washington, 1975: 230, repro. 231. Walker, John. National Gallery of Art, Washington. New York, 1975: 130, no. 126, repro. Eisler, Colin. Paintings from the Samuel H. Kress Collection: European Schools Excluding Italian. Oxford, 1977: 59, under K2088 (1961.9.28). Lane, Barbara G. The Altar and the Altarpiece: Sacramental Themes in Early Netherlandish Painting. New York, 1984: 32, fig. 21. Walker, John. National Gallery of Art, Washington. Rev. ed. New York, 1984: 130, no. 120, color repro. European Paintings: An Illustrated Catalogue. National Gallery of Art, Washington, 1985: 266, repro. Hand, John Oliver and Martha Wolff. Early Netherlandish Painting. The Collections of the National Gallery of Art Systematic Catalogue. Washington, 1986: 184-188, repro. 185. Kopper, Philip. America's National Gallery of Art: A Gift to the Nation. New York, 1991: 22, 68, color repro. National Gallery of Art. National Gallery of Art, Washington. New York, 1992: 42, repro. Klein, Peter. "Dendrochronological Analysis of Panels of Hans Memling." In Hans Memling: Essays. Edited by Dirk De Vos. Bruges, 1994: 103. Vos, Dirk de. Hans Memling: The Complete Works. Translated by Ted Alkins. Antwerp and Ghent, 1994: no. 77, 226-277, color fig. Dwyer, Eugene. "Luxury." In Encyclopedia of Comparative Iconography: Themes Depicted in Works of Art. Edited by Helene E. Roberts. 2 vols. Chicago, 1998: 1:533, 534. Esch, Anke. "Het boogmotief bij der Vlaamse primitieven: Een synthese." In Dirk Bourts (ca. 1410-1475), een Vlaams primitief te Leuven. Exh. cat. Leuven 1998. Leuven, 1998: 177, fig. 11. Hand, John Oliver. National Gallery of Art: Master Paintings from the Collection. Washington and New York, 2004: 48-49, no. 35, color repro. Michelman, Dorothea S. "A German Treasure Trove: The National Gallery of Art." German Life (June/July 2005): 42, color fig. Snyder, James. Northern Renaissance Art: Painting, Sculpture, the Graphic Arts from 1350 to 1575. Revised by Larry Silver and Henry Luttikhuizen. Upper Saddle River, 2005: 202; 196, col. fig. 10.7. Lane, Barbara G. Hans Memling: Master Painter in Fifteenth-Century Bruges. London, 2009: 63-64, 318-319, 47. Michiels, Alfred. Hans Memling. New York, 2007: 56, 58, color fig.